I'm really not sure what to call this, but I found pics on my comp of a tutorial I made ages ago with a shoddy camera phone (The picture quality shows). I hope no one minds me posting this. Also I know a fair while back I had this was posted on VF's DTBD cult (My username was CitronicKitten), my account since has been deleted due to inactivity - So I'm not sure if this is still up there, of if it's fine to repost. If not, it can be taken down. So the main idea behind these was I just wanted to get rid of some masses of el cheapo acrylic blended yarn you normally use for knitting that I had lying around. And yarn wraps I think are generally wrapped around your own hair, and I just used these to make falls instead as a more temporary option but didn't want them to look too obviously 'yarn-y" haha. Again I apologise for the pic quality, I don't mind redoing this at a later date with clearer pics. Lace, or something to attach them to. 1. Cut your lengths of yarn, generally longer than the length you want the end result to be. 2. Loop several strands of yarn over the lace and start braiding tightly until you get to the end. Use more yarn to if you want a thicker end result. 3. Once you get to the end, use one of the loose end bits to make a tight knot at the end of your braid. 4. Using about 6-8 strands of yarn you've already precut, place them in a straight line without overlapping behind your braided strand. With about 2 inches overhanging on the left. 5. Fold the 2 inches on the left in a diagonal towards the right, holding it down tight. 6. Cross the remaining length you had overhanging on the right back over the diagonal bit you've just done, and wrap tightly in a downwards motion, locking the diagonal bit down, and working your way neatly down to the bottom. Try not to overlap any strands and keep it uniform. Knot it off once you reach the bottom. 7. Once you've finished wrapping and have made sure everything is super tight. Hold the wrap out straight and scruff it up with the scrub brush. 8. Flatten the edges down with a hair straightener. It just helps smooth the scruffy bits down and conceals the lines or "seams" of the yarn that make it obvious it's yarn. 9. What you should have is a nicely wrapped, smooth looking yarn-wrap. 10. Keep working till you have your desired amount. You can try different styles, use two different colours side by side in wrapping to create swirls, or use a single strand in an opposing colour to create criss-crosses, whatever you feel like. The end~ Figured I should share this seeing I still have it on my computer haha. Just some more pics of them. Last edited by MissAnthropik on Mon May 31, 2010 7:54 pm, edited 1 time in total. 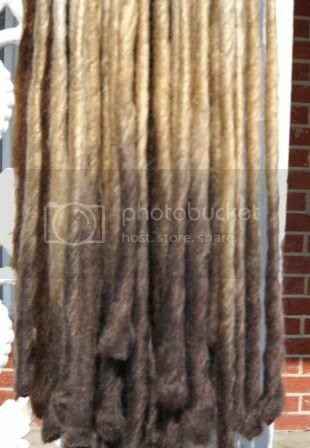 Re: Alternative to Yarn wraps/Look alike roving? Waa those are great! The wigs brilliant! This is a great tutorial but could I be cheeky and ask is there any chance of getting better quality pictures as it is difficult to see what is happening as the pictures are too blury, thanks!! Squidgy wrote: This is a great tutorial but could I be cheeky and ask is there any chance of getting better quality pictures as it is difficult to see what is happening as the pictures are too blury, thanks!! Haha no problems XD I'll eventually get around to it. I did that during a time when all I had was a reaaally crappy camera phone. I still don't quite get it how you finished the wrap ( the end of it). Did you make a knot from the red yarn in the picture too? I am drooling right now! Awesome! I have a whole paper bag full of scrap yarns and it will be going to this project. Thanx for posting! awesome tut! I have loads of yarn from my "I need to learn to knit" phase. What is the end texture of these? I finished a set of these, so I hope it's ok to post a pic. They feel really soft, almost like a cheap angora sweater if that makes much sense I used a regular iron (don't have a straightener), but I got the same results. My ends have these bulbs from knotting the yarn because I wasn't sure how to finish them. Reminds me of those tentacle monsters from FFVIII in the training center. How do you get the ends smooth and bulb free? brandalynn wrote: I finished a set of these, so I hope it's ok to post a pic. They feel really soft, almost like a cheap angora sweater if that makes much sense I used a regular iron (don't have a straightener), but I got the same results. My ends have these bulbs from knotting the yarn because I wasn't sure how to finish them. Reminds me of those tentacle monsters from FFVIII in the training center. How do you get the ends smooth and bulb free? wow yours look great!! Did you buy the yarn like that or is it three different coors of yarn? Thanx I bought the variagated yarn and cut lengths from the end of the darkest color to the start of the lightest color then wrapped from light beige to dark brown. I'm hoping to start some that go from yellow, lime green and turqouise, but alas, my ends look so funny I've put a hold on that project. brandalynn wrote: Thanx I bought the variagated yarn and cut lengths from the end of the darkest color to the start of the lightest color then wrapped from light beige to dark brown. I'm hoping to start some that go from yellow, lime green and turqouise, but alas, my ends look so funny I've put a hold on that project. I wish you had a close up of your ends, from your pic they look fine to me. They're really knobby and it was a pain brushing enough yarn to cover most of the knot. I fell in love the moment I saw this. I used to make yarn extensions before I learned how to work with kk. But I never made anything as awesome as this. I think I just found my new favorite stash-buster, and I have a HUGE stash to bust!! So excited! Thanks!! I've used this quite a few tomes! Do you mind if I post this back on VF? For the ends, if you take a few pieces, wrap, tie, and snip, you end up with a smaller knot. Bwaahahaha!!! Thank you! The knots on the end were still driving me nuts Such a simple answer, too. Makes me feel all sorts of fail. I must of done something wrong.. When I started to scruff it up with a brush, the yarn at the top started coming unraveled. =[ I wrapped it pretty tightly at the top to prevent that but it still happened. Tipsyxx wrote: I must of done something wrong.. I like to thread the yarn through the top of the braid with a loopy needle so it stays there. Works for me!